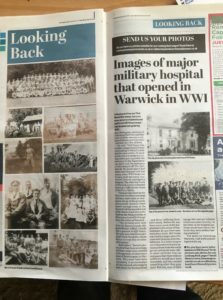 The photographs of Hill House temporary WW1 hospital sent to us by James Grundy, have been used in a double-page spread in the Warwick Courier (Nov 30th). Mr. Grundy inherited an album of 700 photos from his grandfather, Alfred Grundy, who was a patient at the hospital in 1917. The rare pictures show that there were large military-style tents erected in the grounds, and a group photo of about a hundred patients shows that it must have been an extensive facility, rather like a field hospital in the centre of Warwick. Hill House, now demolished, overlooked the racecourse. Our War Memorial Project is still searching for more photos of those from Warwick who died in the First World War and are commemorated on the Church Street war memorial. As our researchers find more information at the County Record Office, from online sources, or from family albums, we’ll post them on this website.